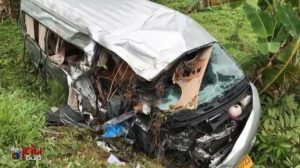 A foreign tourist and a Thai driver are dead after a van travelling from Krabi airport to Koh Lanta hit a song thaew. The accident happened on the Huay Nam Khao – Koh Klang Road. Initial reports said that seven people were injured – three in the van and four on the other vehicle. They were the driver of the van – Sarawuth Suphap – and an unidentified foreign woman.